As far as sweets are concerned, I can usually take them or leave them. I understand the appeal of pastries, in all their myriad forms, but I just prefer something salty over something sweet most of the time. If there is a cheese plate offered for dessert, I always opt for that over gooey chocolate cake or even a perfect pear tart; my dear friend Michael made me appreciate cheese as an end to a meal long ago, and I can’t thank him enough for that pearl of wisdom – there is something so satisfying about it. That said, there is one confection that is my absolute downfall: Angel Food Cake. It probably started with my mum, who always made a special cake for our brithdays when we were little. From my first birthday, there is a hilarious sequence of photos of me (“bald as a billiard ball,” as mum would say) in my high chair with a giant chocolate cake in front of me; I taste the frosting, show off a mostly tooth-less grin, plant my face into the cake, and then emerge with my whole face covered in frosting. My parents always did a lot to make my birthday very special, and that always included a cake. One year, mum found a recipe for Stuffed Angel Food Cake, which basically halted the need to look for another birthday cake recipe ever again. It was your basic homemade Angel Food Cake (which I find are always much bigger than the store-bought kind) filled with sweetened whipped cream flavored with cocoa powder. It was like heaven to me as a young birthday boy. I would dig in for piece after piece of that cake, spacing out my portions over a two-day span; with much sadness, I would savor the last piece and wait until the next year for my next fix. Though it was easy and relatively cheap to make, the fact that I only had that cake on my birthday made it very special. It has been years since I had Angel Food Cake of any kind (probably close to a decade) and something prompted me recently to make it again. Everything about it is brilliant: the flavor, the texture, the extreme whiteness of the interior. Sure, this cake takes a little more effort than opening a box and mixing together, but it is absolutely worth it. I used the Joy of Cooking recipe for this one, and made no alterations. In future postings, I plan to switch up the flavorings and see how we might experiment with the sugar level (I don’t think it needs to be that sweet). Also, I am pretty sure I’ll be posting the birthday version this June. Stay tuned! 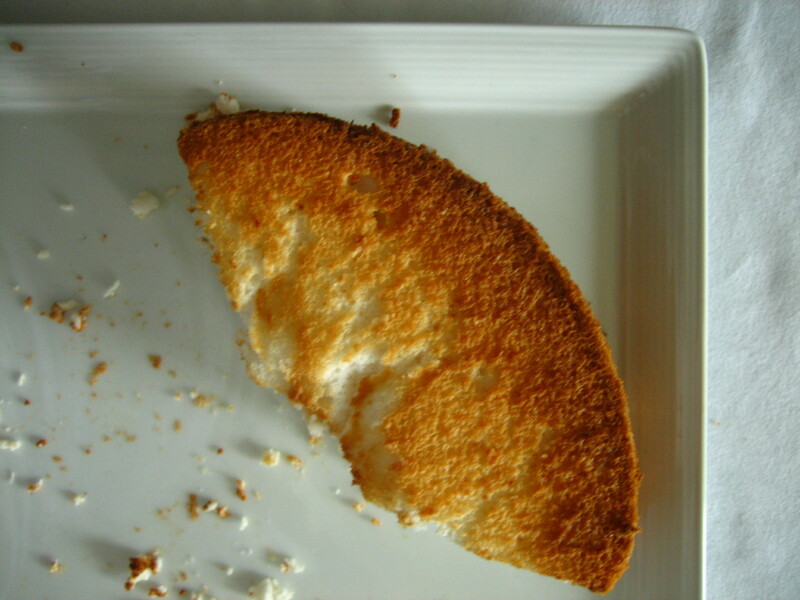 Wow – the stuffed angel food cake sounds amazing! It is! Look for it this June!